I headed for Musselburgh seeking the reported Wood Sandpiper and maybe the Spoonbill but I was annoyed to find my way was obstructed by the surging masses of people involved in the Edinburgh Marathon. So a change of destination was quickly decided. We headed instead for Tyninghame Bay. My companion for the trip was my lovely wife, Jenny as John had family commitments. 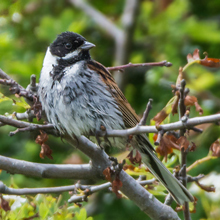 On leaving the carpark my attention was drawn to a singing Reed Bunting sitting atop a bush. 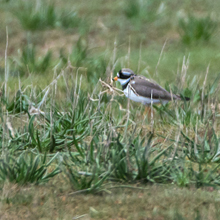 On the salt marsh I photographed a Meadow Pipit and a distant Ringed Plover. 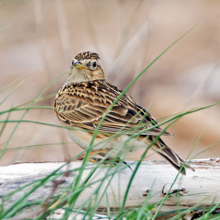 As we approached the beach we were met with a chirping Skylark. 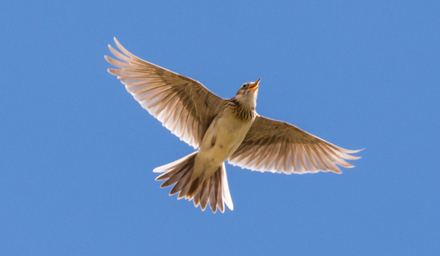 It was the first of many Skylarks we were to see. 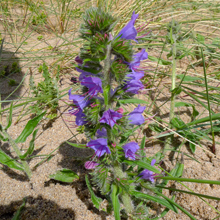 As we crossed the grass-covered sand dunes we came upon several plants living in the very sandy environment. 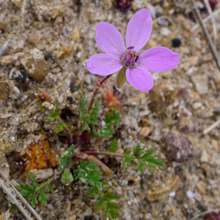 Little pink flowers of Common Storksbill, the bright yellow Bird’s Foot Trefoil flowers and lilac flowers of Sea Rocket were fairly abundant. 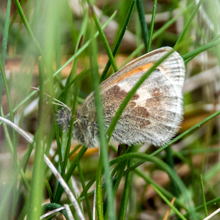 Every now and again we would disturb a Small Heath butterfly that would dart elusively through the grassy dunes. 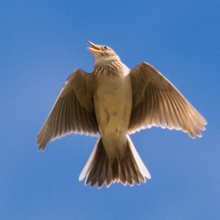 We passed through an open area within the grassy dunes where there seemed to be very many Skylarks calling and occasionally rising singing into the air. 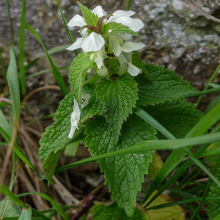 As we finished our short circuit of the salt marsh we found yet more wildflowers – Thrift, Vipers Bugloss and White Deadnettle. 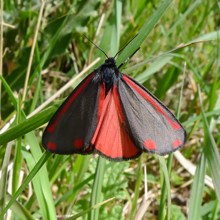 Then it was back to the car for a cup of tea and a chocolate biscuit. Not a bad haul of shots considering we had lost so much time getting out of Musselburgh. 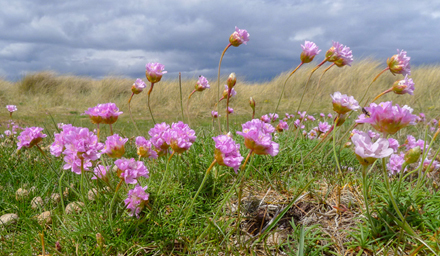 My shots of the day were of a rising Skylark and a patch of Thrift. 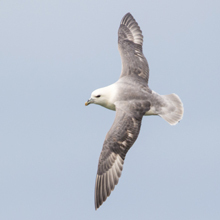 After the lack of birds last week we were hoping for an improvement at Belhaven Bay and Dunbar Harbour. Our customary breakfasts at Morrisons in Dalkeith were 8/10 due to overcooked yolks and sloppy bacon. Undeterred by this early setback we headed east also hoping for an improvement in the light as the sun was yet to show from behind a 100% coverage of grey cloud. 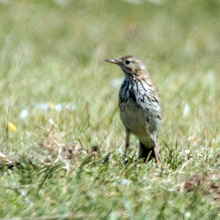 At the Belhaven Bay carpark we were greeted by small flock of House Sparrows chirping merrily as they chased insects. 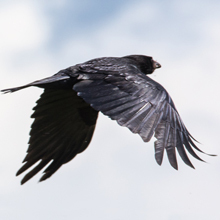 We walked along the path to Seafield Pond and spotted an oddly marked Carrion Crow. 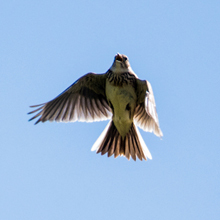 We wonder if this was an old bird or if it was leucitic. 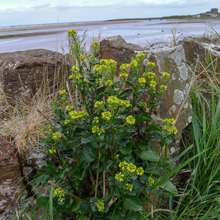 By the sea wall we found a yellow wildflower I’ve yet to identify – I think it is a member of the Cress family. 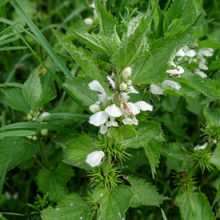 Beside it, White Deadnettle plants were now starting to flower. 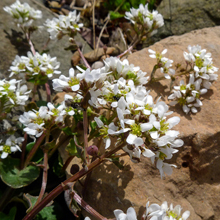 Another plant by the wall was Hoary Cress. 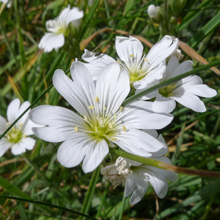 It was just coming into flower and I think if I returned in a few weeks it would be much bigger and dominating the verge. 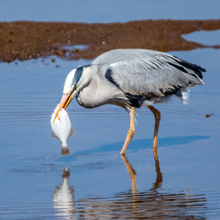 As we cautiously made our way down to the Pond, a Grey Heron flew over and landed at the opposite end and immediately started to catch small fish. 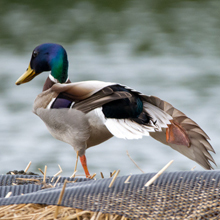 Mallards resting on an artificial island stirred as we approached. 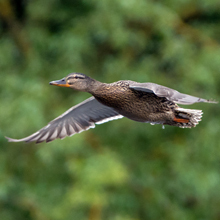 A female Mallard flew by, chased by another female. 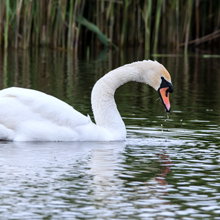 Unstirred was a Mute Swan gliding serenely into view past a pair of Tufted Ducks and a statue of a man with a fish on his head. 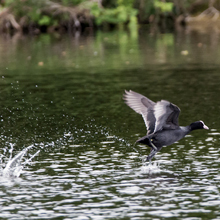 Occasionally a screaming pair of Coots would engage in battle usually resulting in one frantically scampering away, living to fight another day. 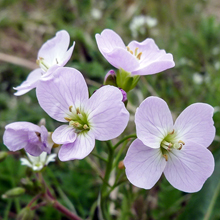 By the Pond I found Cuckoo Flowers and Common Mouse-ear. John found what we thought was a butterfly or moth pupae. 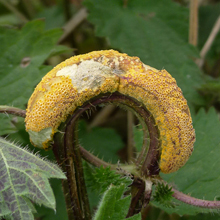 I later discovered it was actually a fungus, Nettle Rust. 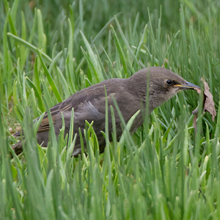 Nearby a fledgling Starling investigated a leaf before seeking out its mother for an easier feed. 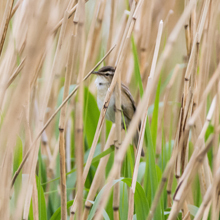 As we left the Pond we paused to catch a glimpse through dense reeds of a singing Sedge Warbler. 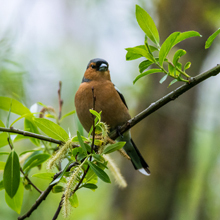 In the trees a Chaffinch was keeping an eye on us. 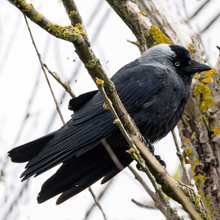 A Robin made off as we passed but on a treetop a lazy looking Jackdaw couldn't have cared less. 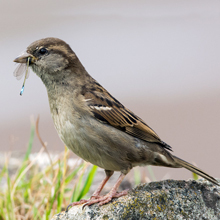 On the seawall a female House Sparrow had a mouthful of Damselfly presumably for its nestlings. 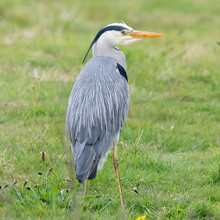 We startled another Grey Heron as it fed in a ditch adjacent to the path. 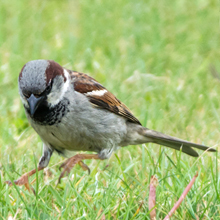 It moved just a few metres further away and didn't look too pleased as it waited for us to go away. 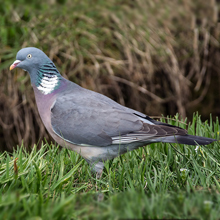 Just as we reached the carpark a pair of Woodpigeons were foraging in the salt marsh. 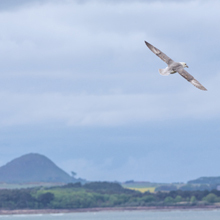 At this point we drove up to Dunbar Harbour to look for Kittiwakes and Fulmars. 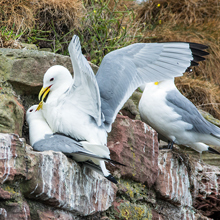 When we got there many Kittiwakes were nesting on the castle wall. 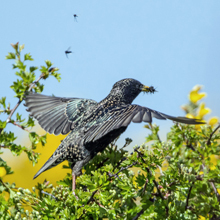 As we stood by the clifftop, the sky was filled with many birds. 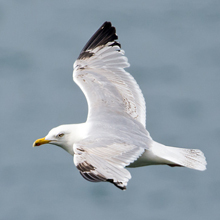 I warmed up my camera for flying shots by snapping a Herring Gull. 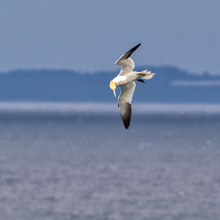 Offshore a pair of Gannets dived dramatically over and over again. 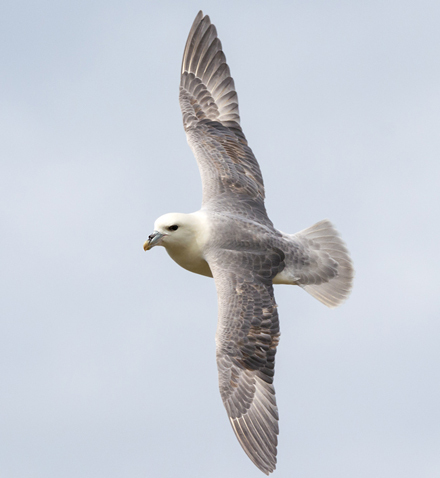 Then, after a bit of a wait, several Fulmars treated us to a spectacular display of aerial skills before heading off again seaward. 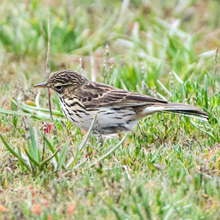 We ended our trip believing we had got our mojo back – lots of birds. Our reward was tea and a pair of custard tarts, i.e. 2 each! It was too much - eyes bigger than our bellies! We travelled back home feeling a bit stuffed. 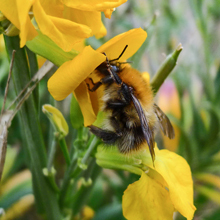 My camera was certainly stuffed with photographs. 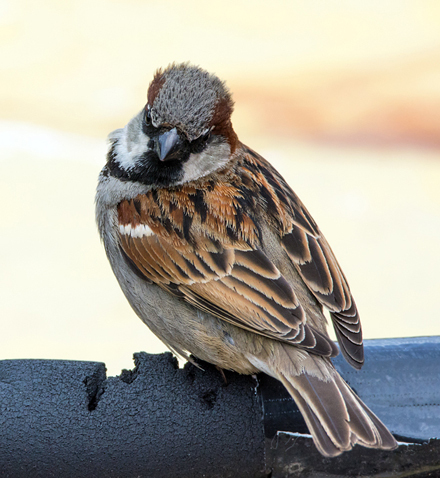 Shots of the Day were of a House Sparrow and a Fulmar, both taken at Dunbar Harbour. 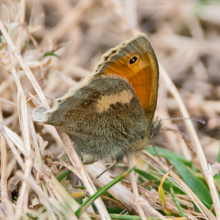 After reports of possible migrants in the Lothians we set off for East Lothian, specifically Barns Ness, in the hope of seeing some of these little travellers. 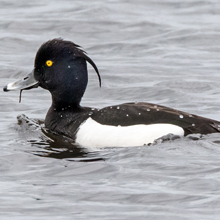 As it turned out we saw fewer birds than normal but we were lucky to find other delights that certainly made up for our initial disappointment at the lack of birds. We got off to a great start in Dalkeith Morrisons cafe where we had a very satisfying breakfast. On arriving at Barns Ness the tide was very low, taking the seashore, and the birds, many metres out. 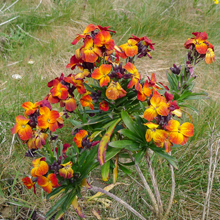 We noticed though that there were many flowers and insects that we could investigate. 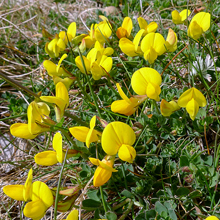 Starting at the lighthouse we found patches of Bird’s-foot Trefoil being probed by Common Carder bees. 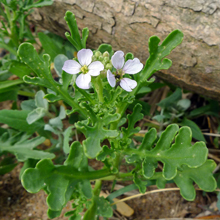 Also there were also patches of Common Scurvy-grass and Wallflower. 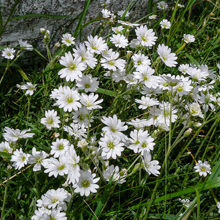 By the wall of the lighthouse we found beautiful clumps of Greater Stitchwort. 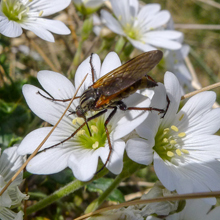 One flower had the dagger fly, rhamphomyia crassirostris, thrusting its needle-like mouthparts deep into the centre of the flower. 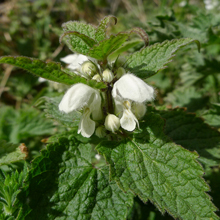 Also by the wall the white flowers of White Deadnettles were starting to show. 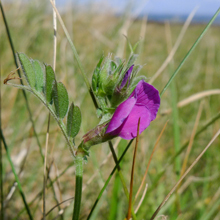 As we walked along the coastal path we stalked a Small Heath butterfly and in doing so I came across a new flower for me, Spring Vetch, whose flower is similar to Common Vetch but a lot smaller. 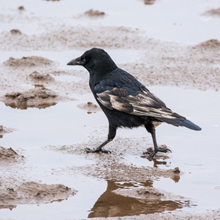 The only bird we saw that came anywhere near us at that time was a lone Rook foraging in the rocks. 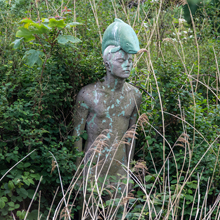 We decided to move westwards to a wooded area to see if we could find anything there. 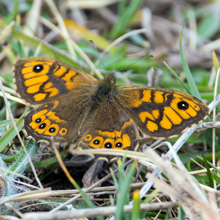 A wall butterfly was our only find until we arrived at the old disused caravan site. 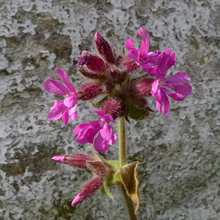 A very common flower in early in May is the lovely Red Campion. 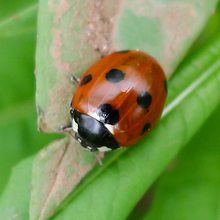 Whilst photographing these, a 7-spot Ladybird wandered into my view. 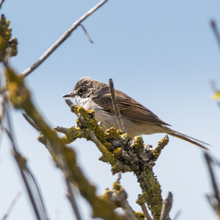 Then the manic calls of Common Whitethroat drew me to a bush near the carpark while John photographed some St Mark’s Flies on grass. 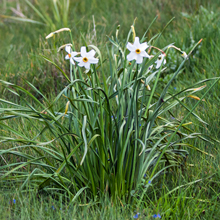 I spotted some Narcissus flowers, romantically named, Poet’s daffodil, probably a leftover from the caravan site. 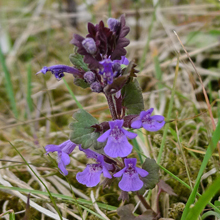 Beside these were little Ground Ivy plants with their dainty purple flowers. 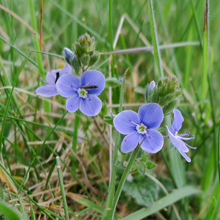 In the grass little blue flowers of Germander Speedwell flowers were dotted around. 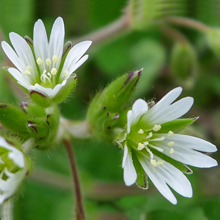 We decided to check the tall trees bordering the site for migrants but all we found of interest there were plants with small spherical flower heads. 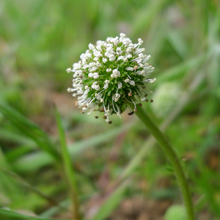 These were probably developing heads of Sheep’s Bit Scabious. 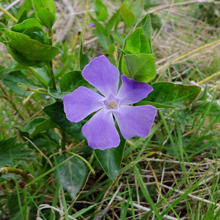 Another remnant of the old caravan site we found was the Greater Periwinckle with its fairly big purple flowers. 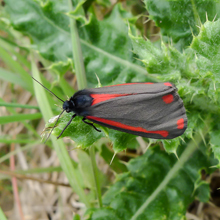 As we made our way back to the car we disturbed a Cinnabar Moth. After a long chase I managed to get a couple of nice pictures. 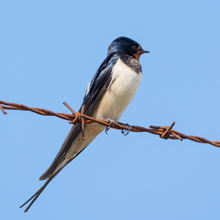 We moved on briefly to Torness to see if we were missing anything there – we weren’t – however by the roadside an obliging Swallow posed long enough for John to snap it from his side of the car. After that it was time for Danish pastry and tea. It had been a bit different from our normal Sunday – but enjoyable nevertheless. 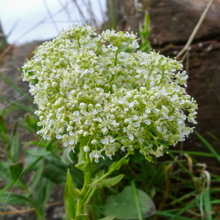 We were excited at the prospect of spending a warm, sunny, early summer’s day walking along Pow Burn near Prestwick, as we could expect to see some recently arrived birds. But not before we had dined at Kilmarnock Asda’s cafeteria for a bit of breakfast. It was marked down a wee bit this week, to 8.5/10, due to stodgy beans and over-cooked bacon. 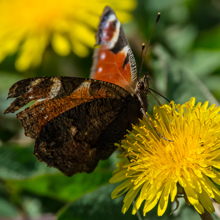 Our first sighting was a Peacock butterfly feasting on Dandelions. 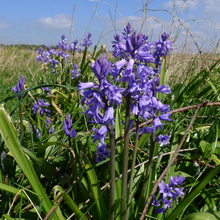 The banks of the Pow Burn were well populated with vividly-coloured Bluebells. 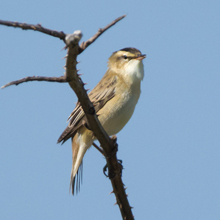 The first bird we encountered was the Sedge Warbler. 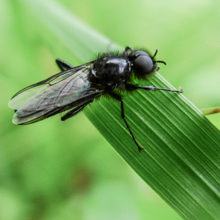 Its crazy song consists of seemingly random notes and sounds. It was to be the first of many encounters. 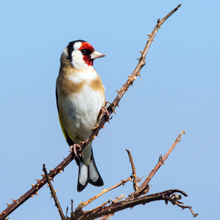 As we sat patiently waiting for the Warbler to show as it hopped amidst the dense mass of twigs, a bold Goldfinch breezed in and took centre stage, belting out a stream of twittery notes, apparently ignoring our presence. 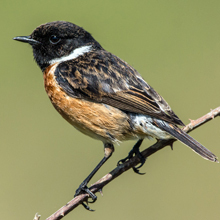 Further along the path, as we stalked another Sedge Warbler, a couple of male Stonechats appeared to be vying for the attention of a lone female by posing and singing on tall stalks of grass. 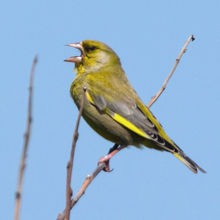 Nearby a Greenfinch was letting rip its rasping sounds as a Starling hovered over a bush, easily gathering flies probably to take to hungry young nestlings. 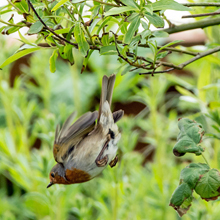 We watched a Stonechat’s attempt at taking a butterfly. 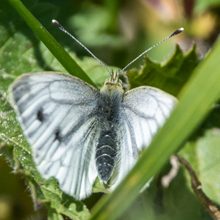 Unfortunately I didn't manage to photograph the struggle but I did get the Green-veined White butterfly as it caught its breath. 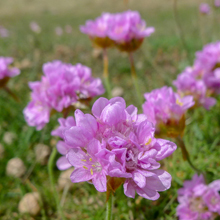 As we headed back to the car a Skylark rose high over our heads cascading its reeling sounds far and wide. 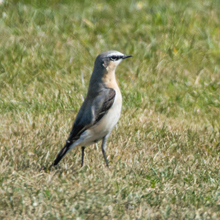 We spotted a Meadow Pipit and then a male Wheatear as they searched and probed the golf driving range for tasty morsels. 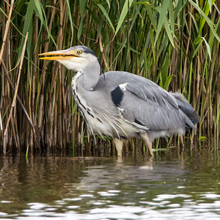 In the Pow Burn a Grey Heron had a little more than a morsel to deal with as it had caught a large flatfish. After a few unsuccessful attempts at downing it the Heron flew off leaving the gulls to have a go. Back at the car we had tea and chocolate eclairs as we sheltered from the warm rays of the sun in the shade of a bank of tall hedges. 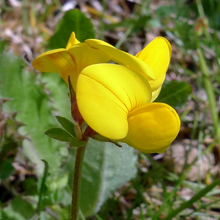 It must be summer right enough!